Under drains collect sub surface moisture or allows surface water to penetrate downward into a trench that consists of a perforated pipe embedded in clean rock lined with a synthetic drainage fabric. The trench is then covered with topsoil and seed or sod or planting medium and mulch. Under drains can be installed along foundations or in relatively flat lawn areas or planting beds. French drains collect sub surface and/or surface water. French drains are typically used along foundations when the surface water cannot be diverted by creating positive drainage away from a structure. French drains are usually installed on the exterior of a structure but in some severe cases the installation of an interior drain line is required. Interior drain lines are installed when water is gaining access into the foundation of the structure where the floor and the walls come together. Performed by removing the floor (usually concrete) and excavating a trench. P gravel is then installed on the top of the footing. 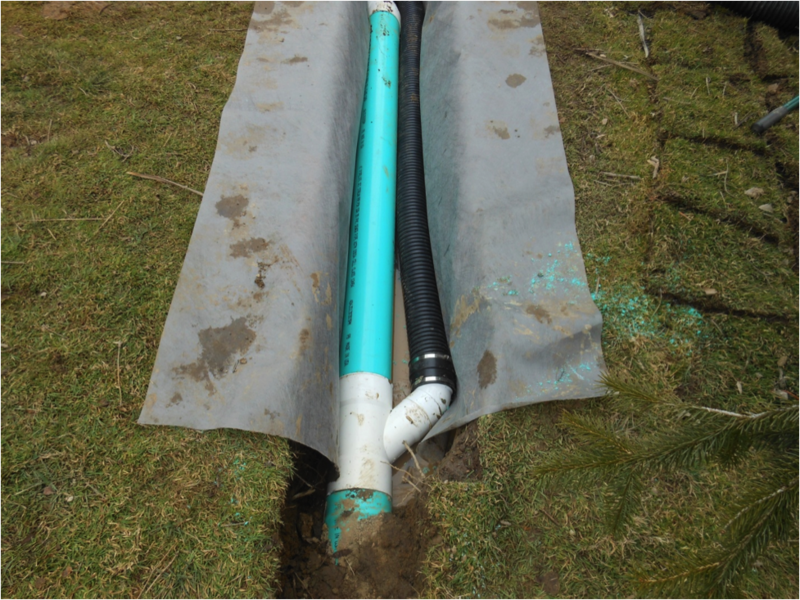 The trench is then lined with a synthetic drainage fabric and a perforated pipe is installed embedded in clean rock. The floor is then re installed with new concrete. The collected water is deposited into a pit and pumped to the exterior of the structure with the aid of a sump pump and a 1 ½ – 2” PVC pipe. The water is then extended underground in a schedule 35 PVC pipe away from the structure.